The Chromosome Browser is created automatically when you load your segment data. If you have matched this kit to your tree, it is displayed beneath the Navigational Fan Chart. Otherwise, it is displayed under the basic kit information at the top of the Kit View. 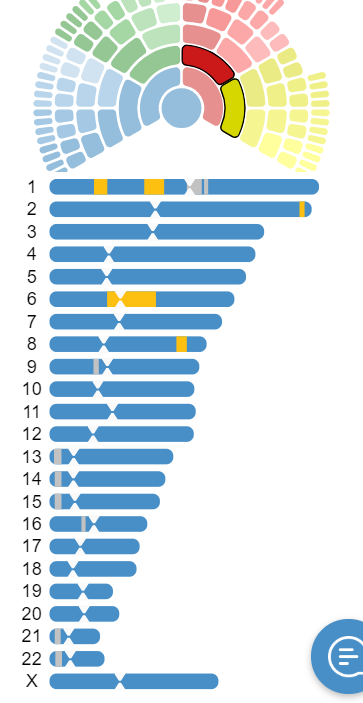 Segments that you share with this kit are highlighted in orange on each chromosome. 1. 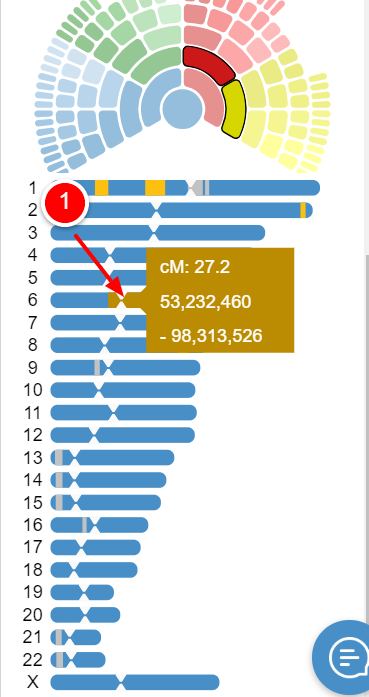 Click on a highlighted segment to see the segment data. This person shares cM: 27.2 on Chromosome 6 between loci 53,232,460 and 98,313,526. 2. To see who else shares this segment, open the segment view by clicking on the down arrow in the blue circle. 3. Select the second icon with the bars and boxes. 4. This will open the Segment View. Open the Chromosome bar by clicking on the down arrow. Each white rectangle represents a matched segment and each circle represents a kit that matches that segment. Notice that one other person shares this exact large segment. Also notice many others share portions of the same segment.The larger the segment, the more closely you are likely to be related. Although others may share the same segment, it may have been acquired through chance or through different (as yet unknown) relationship. It is always a good idea to find other substantiation before deciding that this person is indeed a relative.